So many cards so little time....: Sport on tv all weekend = crafting for me weekend! Sport on tv all weekend = crafting for me weekend! Well being banished to my craft area was such a great way to spend a weekend. I made this card with left over things lying about! I cut the heart out using the silhouette and edged with green ink and added the gemstone. The scrap of green was embossed and sanded and mounted onto mirri then the lace ribbon stuck on and the white ribbon tied around it. 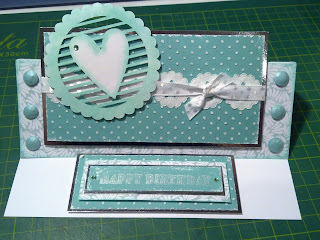 The green leaf paper was my inspiration for this card. It is from the first TSV I got from QVC around 4-5 years ago! I decided it was time to use up all the old stuff I have that I don't tend to reach for. I folded the front of the card in half and covered the part that shows with the green leaf paper and edged with the same green ink pad. 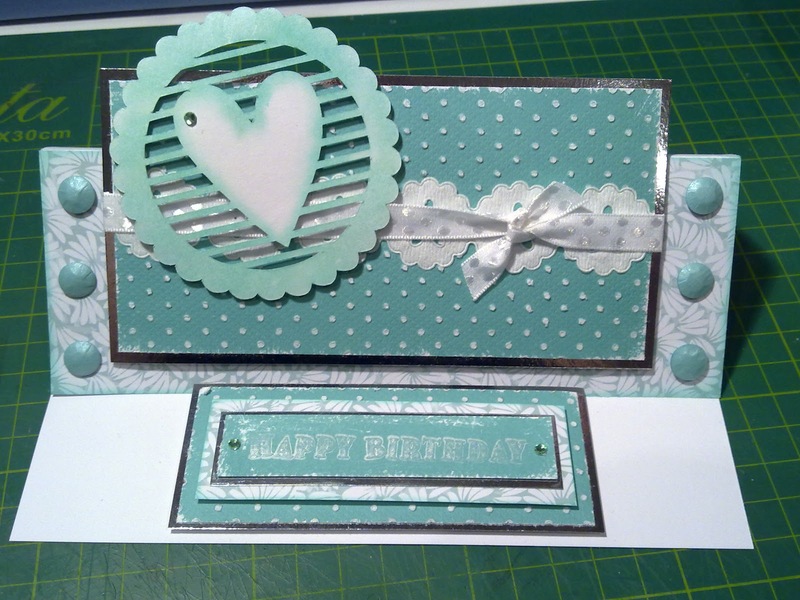 Added the topper by laying the card flat (to make sure the top of it stayed within the size of the card!) and stuck on the heart with foam pads. 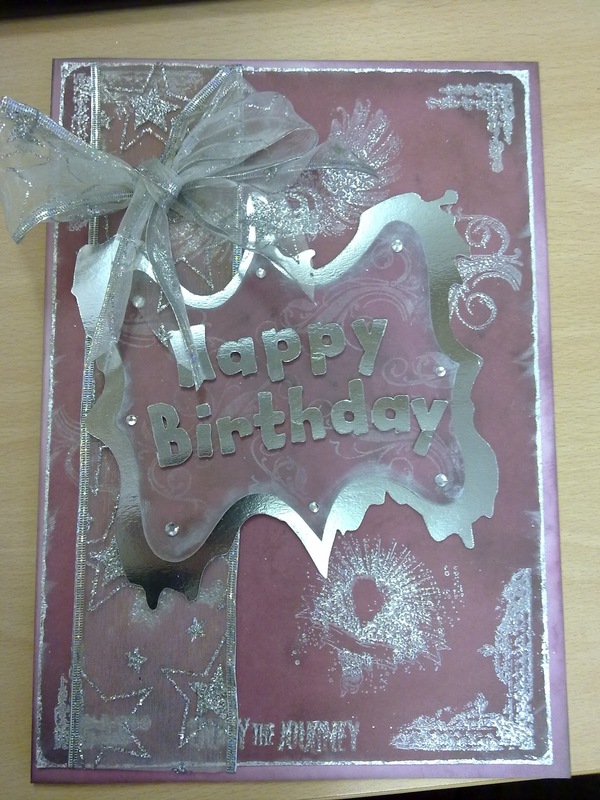 Stamped the happy birthday in white, tried to emboss it at first but it wasn't readable! Trial and error but not a very good stamp to be honest and I wish I'd changed it but it all works together so I didn't want to pull it all apart! Mounted all the layers using foam pads under the mirri layers and added it to the bottom of the card so it would hold up the front and added the card candi with foam pads. Done! I used an A4 card, covered in Tim Holtz paper which I had stamped and heat embossed. The Happy Birthday topper was all cut out with my silhouette and I added the glittered star wire ribbon.